There are now more overweight than underweight women in Cambodia, according to a study published this month in the science journal Nutrients, a fact health experts say increases women’s risk of non-communicable diseases. The study gathered data from Cambodian demographic surveys from 2000 and 2014, looking at women between 15 and 49 years old. The results showed malnutrition shrinking and obesity growing until obesity surpassed malnutrition for the first time in 2014. Both populations face health risks. “Cambodia is thus now facing a double burden of malnutrition in women and has to define and implement appropriate strategies to improve the nutritional status of women,” the study states. The researchers define underweight as having a body mass index of less than 18.5kg per square metre of height and overweight as over 25kg per square metre. Anemia and difficulties in childbirth are major problems for underweight women, who tend to be from poorer, more remotely located households, researchers found. Overweight women on the other hand face a growing risk from non-communicable diseases (NCDs) like diabetes. Wealth is positively correlated with being overweight, but education level is negatively correlated. Nonetheless, obesity is rising much more quickly among the poor. 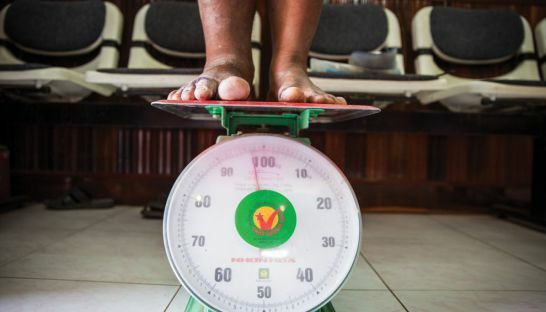 Iman Morooka, the spokeswoman for UNICEF Cambodia, confirmed the data, saying that 18 per cent of adult women in the Kingdom were overweight, compared to 14 per cent of women who were underweight. World Health Organization spokeswoman Vicky Houssiere said the burden of NCDs in Cambodia was growing. Collectively, diabetes, cardiovascular disease, cancer and chronic respiratory disease caused 43 per cent of deaths in Cambodia in 2014, up from 35 per cent in 2011.